A simple and quick go to meal that is packed full of flavour. Perfect for both sunny or winter evenings. 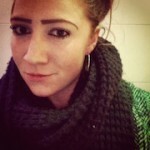 Rosie is from West London and writes about her passions, which include cooking with the best ingredients possible. She also has her own pop ups to try out her recipes, see her blog for more info! Heat a small amount of olive oil in a deep frying pan, over a medium heat. Add the finely chopped onion and fry for 3-4 minutes until it is turning translucent. Reduce the heat slightly; add the coriander seed, black pepper, crushed garlic clove, and finely sliced lemongrass, and fry for a further 2 minutes. Now stir in the curry powder, turmeric and saffron strands, and pour in the coconut milk. 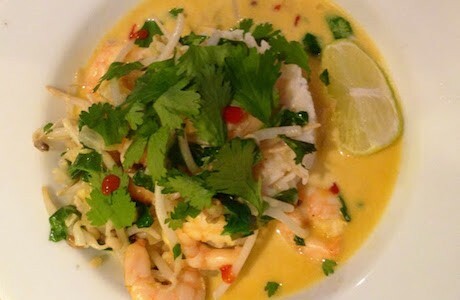 Once the coconut milk is gently simmering, mix in the zest and juice of a lime, and the raw prawns. Stir everything together and simmer for 2 or 3 more minutes, or until the prawns have turned pink. Remove from the heat, chuck in the bean sprouts, and serve in bowls with rice noodles or rice, a few thin slices of chilli, a sprinkling of coriander leaves, and a wedge of lime.